If you love nothing more than entertaining friends, family and other VIPs in your home, then a sleek and stylish pergola from Australian Outdoor Living is the perfect way to add chic and style to your outdoor entertaining area. It’s only natural to want to share the things we are most proud of with our friends, family and the people we love. For many house-proud Aussies, the thing we cherish most is our home. Your humble abode, dwelling space, a cave to call your own – however you choose to put it, it’s the product of many hours of dedicated time and hard work, and it is something to call your own. But when it comes to writing the invitation list for your next DIY dinner party, function or event, the last thing you need is to feel limited by the amount of space in your home. Let’s face it, even the biggest dining table to seat and feed eight is an uncomfortable squeeze when you have nine mouths to feed. 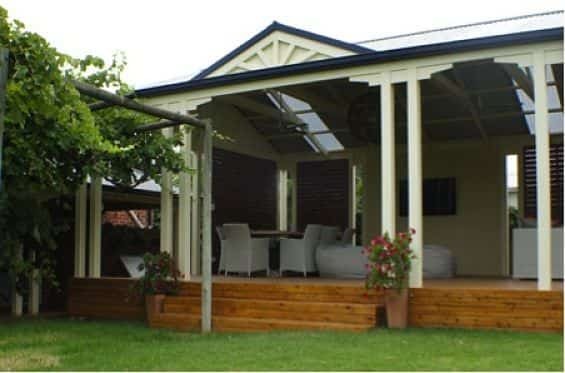 Avoid a dreaded cull of your list of invitees by extending your home with an outdoor pergola! At Australian Outdoor Living, our extensive range of outdoor pergolas features world class design and award-winning functionality. Slick, sleek and aesthetically pleasing, we make pergolas to extend the living area, ideal for the home of any keen entertainer. With an outdoor pergola, add two, three or even four to your invite list completely stress-free! How to add chic to your outdoor pergola! In summer, Aussies love to take it slow. We make the most of the balmy weather, longer days and relaxed ‘tude that is shared by all. Blessed with the ideal climate, summer is a time for Australians to make the most of the great outdoors. Summer is the time of year that we are most social. With the winter blues melted away, it’s during the summer months that we wish to spend time together. Whether it is with your family, friends or neighbours, an outdoor pergola is the perfect place to entertain. Take it from us at Australian Outdoor Living, an outdoor pergola is a must-have addition to your summer entertaining repertoire! Enjoy dinner, or dine at lunchtime with a summer breeze gently whipping at your hair. Entertain with ease and make the most of the summer weather. If you are dining during the day, make sure you are well equipped with mosquito spray and sunscreen. Or if you fancy a twilight fiesta, crack a cold beer and throw a few chops on the Barbie. Why not invite your neighbours, friends and family around for a laid-back catch up? To make light work of the after-party clean-up, line the pergola table with a durable cloth. Dispose of all litter in order to keep your backyard clean and tidy. Oh, and when you have finished cooking, wipe down the BBQ grill and hotplate with some lemon and steel wool. 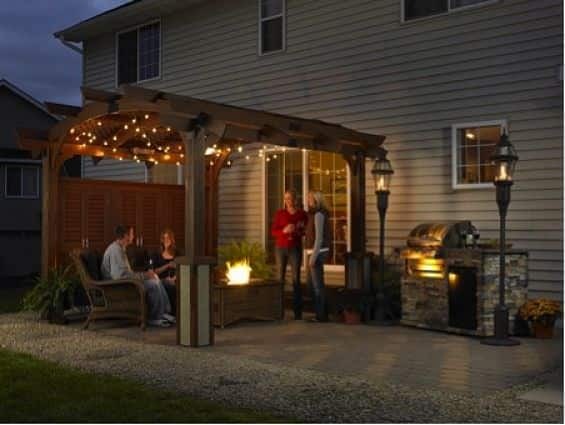 It’s true, you can really make the most of summer entertaining with an outdoor pergola! They might be a close friend, your sister or maybe a memorable someone in your extended friendship group. The Creative Entertainer: that arty individual, blessed with a flair for creating an awesome entertaining experience. When you score an invite from an arty entertainer, even the most mundane of catch ups become an event to be remembered! But surely being a creative entertainer would be a tiresome task! Always looking for that something new, searching for that extra piece of pizzazz to bring to their next dinner party. At Australian Outdoor Living, we have some great news! The creative entertainer can halt the endless hours trawling the pages of Pinterest and construct a pergola from Australian Outdoor Living in their backyard! If you fancy yourself a social firefly, blessed with a knack for creative entertaining and a lover of all things communal, then an outdoor pergola is the perfect place for your next dinner party! Extend your home with a outdoor pergola. Extend your home and extend your guest experience! It is all well and good to meet, greet and entertain indoors. But sometimes a change of scenery is necessary to create an experience worthy of a fond memory. Transport your guests over the threshold and dine outside your home. Whether it is for a Sunday brunch, morning tea or twilight dinner party, pour a glass of wine, sit back and relax in your backyard pergola. An outdoor pergola is very versatile. You might choose to redecorate your outdoor space. Fairy lights hung from the upper perimeter of your pergola, or solar savvy lamps to light up an entry path will add an air of mystical ambience to your entertaining area. The options are endless with an outdoor pergola; a treat for any creative entertainer! An outdoor pergola is a must have for the creative entertainer, or any homeowner looking to add chic to their entertaining repertoire.